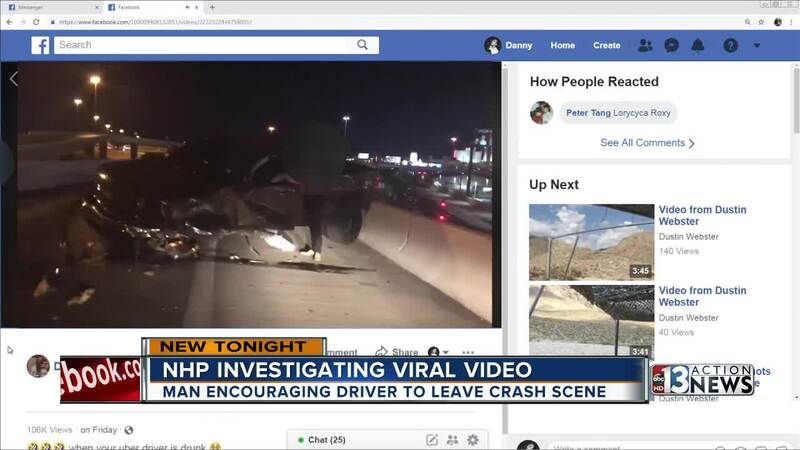 The Nevada Highway Patrol is investigating a video shared on social media that shows a driver encouraging another driver to leave the scene of a crash. The video was recorded Thursday night on the Spring Mountain off-ramp from the northbound Interstate 15, according to NHP. In the video posted to Facebook, it shows a limousine driver pull up to a single-vehicle crash. A man and a woman who were in the truck get out and appear to be OK. But, it's what the limo driver tells the couple to do next that has law enforcement outraged. “Say your car got stolen, you’re gonna get a DUI,” the driver says. NHP says that's exactly what happened. “It’s shocking that someone would roll up on a crash like this, notice someone’s impaired and tell them to leave the scene,” says Trooper Jason Buratczuk. Buratczuk says the video is beyond belief, and the other driver took the bad advice. Investigators say not only did the driver leave, but he also reported it stolen. NHP says it's still unclear whether or not the driver was under the influence. The limo driver in the video can be heard telling the other driver he would get a DUI if he stayed. However, investigators did find evidence in the vehicle that would lead to him being impaired. While this crash only did physical damage to the road and the vehicle involved, it could have been much worse, which is why NHP says this kind of behavior is unacceptable. NHP has identified the driver and will be pressing charges. As of Sunday night, the video had been shared of 2,000 times and had over 160,000 views.